Popularity Of Softshell - Why RefrigiWear Softshell? It is not uncommon for people to believe jackets are interchangeable – they think “if it is good for -30° it must be even better for 0°!” Or “this coat is thicker than that one – it must be better!” Unfortunately, not only are these untrue, they can lead to the purchase of personal protective equipment that hurts productivity rather than helps it. You know that the cold can adversely affect your employees – everything from reducing performance and impairing ability to operate machinery to increased safety concerns and loss of concentration. However, too many layers or a garment that is too thick can be counterproductive. You can make employees overheat or restrict their movements and ability to work. Just as conditions that are too cold negatively impact productivity, an employee that is too warm will be less productive. Concentration will be lost as their focus splits between their discomfort and their duties. As internal body temperature rises, fatigue sets in, drastically reducing performance and increasing the chance of safety risks.1 Exhaustion also comes more quickly when the body is not at ideal temperatures. When an employee is exhausted and experiencing muscle fatigue, they are more likely to make costly mistakes, injure themselves or others, or mishandle equipment. Sweat also plays a role in comfort, and therefore productivity. If gear is too warm for the conditions, the employee will sweat more. When you sweat, your clothing gets wet and it takes additional body heat to evaporate that moisture. If the sweat doesn’t evaporate, the moisture will remain against the skin, cooling you, eventually leading to an uncomfortable chill.2 A jacket that at first overheats and causes sweat eventually cannot protect against the cold caused by the moisture, subjecting the person to two uncomfortable extremes rather than constant protection and comfort. A thicker garment will create extra bulk as well as heaviness. For job duties that require a large range of motion in the arms, frequent turns of the torso or other movement, a thick jacket will hinder movement and therefore the ability of someone to do their job. Consider how much range of motion a job requires and select a garment that meets the needs of the environment plus the person’s need for maneuverability. The thickness of a garment’s insulation plays a large role in warmth, but it’s not the only factor. To pick the right garment for your workers, consider all three of the elements that create warmth: Outershell, insulation and inner lining. The main protection against cold in a jacket is the insulation; air gets caught in the spaces between insulation fibers, creating a barrier against the cold and keeping warmth from escaping. The insulation also accounts for much of the garment’s thickness and bulkiness. So, when choosing a garment, make sure you understand how the insulation affects the warmth and thickness. Synthetic insulation is rated in gram weights — 60 grams (g) means a 1 meter by 1 meter piece of the insulation weighs that much. The heavier the weight, the warmer the insulation. Synthetic insulation is often more dense and less lofty, creating less bulk but often just as much weight. Down insulation, or even synthesized down, will be measured in ounces. Again, the more ounces of insulation, the thicker the loft and the more insulating power. With down or synthesized down, the loft increases with the ounces, so 11oz of insulation will be thicker and bulkier than 6oz of insulation. People often focus on insulation for warmth, but the outershell and inner lining provide warmth as well. For example, a jacket with thinner insulation but a silver lining that reflects heat back and an outershell that protects against the wind can provide more warmth than a jacket with thick insulation but poor outershell and inner lining materials. 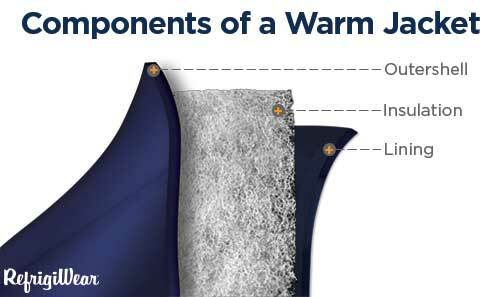 As a result, you can sometimes find lighter jackets with the same insulating power as thicker jackets. When looking at the outershell and inner lining of a winter jacket you will likely find nylon, micro-fiber, polyester or micro-fleece. What is important is that the materials of the jacket you choose meet your requirements. Fleece or silver reflective linings will be added factors for warmth. For the outershell, you can find water-resistant (keeps out light rain or snow for short periods) or waterproof (keeps out rain or snow for extended periods of time with sealed seams). Also, most insulated jackets will tell you if they are wind-resistant (can handle mild wind) or wind-tight (stand up to higher velocity winds). When facing harsh conditions that include freezing temperatures, protecting your employees is vital. It is important not just to consider the cold, but the employee’s activity level and the type of job they will be doing. Make sure you choose the best gear that allows for needed movement and prevents overheating while also protecting them from the elements.